Home / Blog / To theme or not to theme! To theme or not to theme! 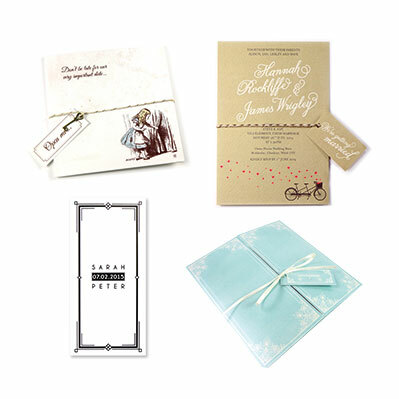 When choosing your wedding stationery you may wonder if a theme is the best route for you. A wedding theme is not essential, however, it could be a good way to narrow your initial choices down and to ensure a style is set for your day and carried through from start to finish. If you do think a theme is for you then here are a few pointers that may help with choosing the perfect one. Start with your own personal style, the way you like to dress and even how you decorate your home can start you off in the right direction. You could look at basing your theme on your travels, looking at trips you have taken that mean a lot to the two of you or even where you plan to Honeymoon. It could also be a design style you both love, art deco and vintage themes are very popular. Love Invited have a wide range of themed wedding stationery collections from The Gatsby inspired Hollywood Glamour to the fun and rustic Country Bunting. Each collection includes items from Save the dates and Wedding Invitations right the way through to Table Plans and Thank You Cards. Alongside your over all theme, colour is an important consideration. If you have a theme this will give you some insight in to the colour palette you can use for your wedding stationery. If you don’t have a theme then just think of the colours you like and create a palette that you would like to see at your wedding. A couple of good examples is the use of pastels for Vintage or Country weddings or black and white for Art Deco or stately home weddings. When choosing your wedding stationery consider how it will sit with the venue you have chosen. With any venue try to tie in the look and feel with your stationery. A floral invitation would complement a garden wedding or a vintage look would work well in a marquee. What if you don’t want a theme? You may decide that your ideas don’t really suit going down the stationery theme route. So, if you are looking for something a little different we also offer a bespoke wedding stationery service, that is personal to you. Good luck with planning your wedding day, theme or not! If you need any advice get in touch, we would be happy to help.